We depart every Wednesday and Friday at 8:30 a.m. from Provença 279, Barcelona, near the corner of Pau Claris and Provença streets, in front of Hotel Praktik Bakery-Baluard. This trip is suitable for kids 4-12 years old. 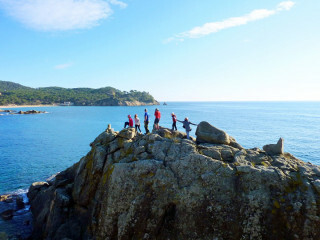 We hike with groups of up to 8 people. Please ask us if you are more. In case you have inquiries about another day of the week, please let us know. What to bring? Please bring a small backpack, hiking or sports shoes (please avoid flip-flops), and comfortable clothes. Depending on the season you might want to bring a raincoat or a warm layer. 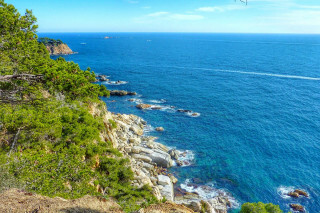 The drive to Costa Brava takes around an hour and a quarter, depending on the traffic. We will take you in a comfortable van so you will have time to relax and ask us all your questions about the area. In summer months, please bring your swimsuit and a towel. 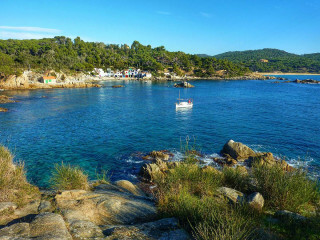 We will stop and enjoy swimming in the coves, so we also highly recommend a snorkeling mask and a snorkel. Covering forests, rugged cliffs, and the blue sea, this hike promises a wild and colorful memory. 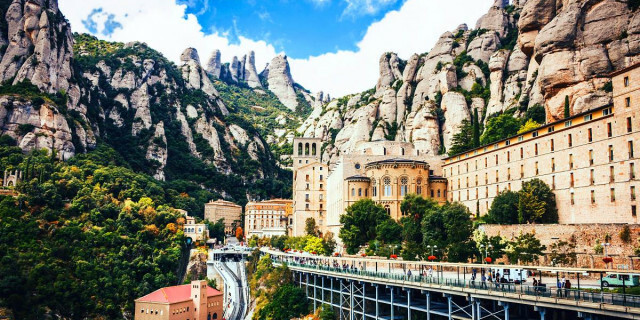 Unlike some popular hikes in more touristy areas of Catalonia, this trip leads off the beaten path, covers both history and culture, and offers an authentic experience. 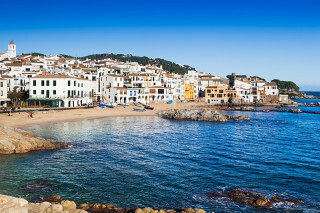 From our meeting point in Barcelona, we drive you to Costa Brava in a comfortable van. Once we arrive, we prepare for the 12 km (7.5 miles) hike. 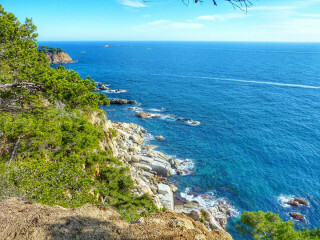 We follow the path of the famous “Camino de Ronda,” a route that runs down the steep Costa Brava and was used to prevent smuggling at the Spanish maritime border. While it leads us through some very remote areas of the coast, we also have a chance to visit a historic seaside village, which is a pearl itself. 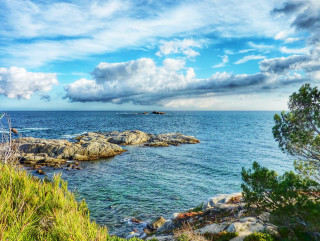 No wonder Costa Brava inspired Salvador Dali in his work. We stay close to the sea most of the time, crossing from forests to open spaces, exploring hidden coves, and enjoying the colorful sights. With no big hills to climb, we cover a friendly elevation of 320 m (1,050 ft). 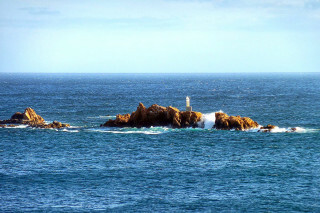 It is an “up & down” type of trail, copying the variable coastline. 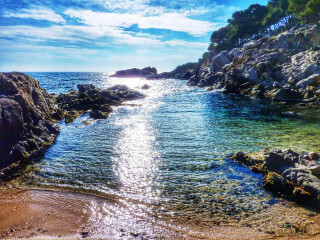 During the day, we enjoy stops for swimming in a remote hidden cove. We have plenty of time to snorkel, so don’t forget your swimsuit and snorkeling gear! When it’s time for a rest, we stop for a picnic lunch under blue skies surrounded by rugged nature. 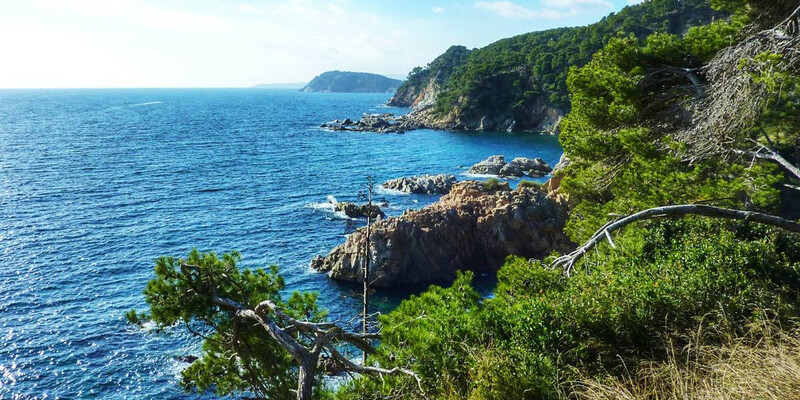 After finishing our hike, we head back to Barcelona, returning around 6:00 p.m.
After trekking through secluded paths over wild terrain, you'll discover the literal meaning of Costa Brava's name: the "Rugged Coast."